West Virginia is a place that I mentally associate with whiskey. It may be that border with Kentucky. It may be the mountains and the inseparable notions of Appalachia and barrel-aged spirits. It may also be a reality: there’s more distillers making Whiskey in West Virginia making bourbon and whiskey (Smooth Ambler included) than there are those making gin. But nevermind the stereotypes and ignore the preconceived notions. Although Greenbrier gin comes from the heart of moonshine country, it stands on its own while retaining a little bit of those bourbon roots. Where are these bourbon roots? Right in the base. 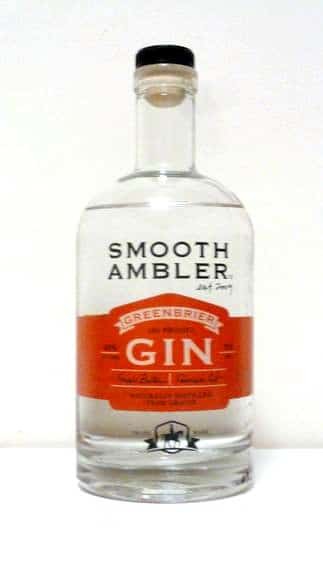 Greenbrier Gin’s base is Smooth Ambler Spirits’ Whitewater Vodka, which unlike many others is not 100% wheat. Its closer to what you may find in a bourbon. Mostly corn, with some wheat and barley. I haven’t had the vodka, so its a bit hard to say how much of the flavor of the base is coming through here, but I suppose it would suffice to say that the difference in base is one of the things that sets this gin apart. Immediately, the nose is strikingly different from most gins. It has a warm and nutty aroma, which evokes passing visions of Bols Genever. Its has a strong citrus scent which brings to mind the grapefruit forward spirit of Breucklen gin. It smells warm and inviting, and just a hint sweet. The taste is warm and balanced. You can taste hints of juniper. The citrus that seemed very strong on the nose is balanced and not overpowering by any means. The citrus balance reveals peppery notes of Coriander and drying sensation vaguely reminiscent of ginger and cinnamon. The finish is long and smooth, while never being too hot. It is extremely drinkable on its own, even neat, with sufficient depth and complexity to warrant further exploration. Though big fans of the London Dry style should take heed. While there is juniper in here, it is very much as a member of the supporting cast than a lead star. Greenbrier Gin sits squarely in the Contemporary Gin camp while taking little other than inspiration from the classic formula. Firstly, Greenbrier gin makes a nice gin and tonic. The complex flavors and latent sweetness means that I would tend to recommend leaving the lime out. Mixed with Q Tonic, it sufficiently carried the show. It highlighted its unique flavors, accentuating the citrus, but left me somewhat wanting. I was able to make a few other cocktails Greenbrier Gin which I think better highlighted its strong points. I thought it made very pleasant martini. Its fullness and depth neat came out and was nicely complimented by the vermouth. I actually thought it made some rather stellar cocktails once I deviated from the canon. The 20th Century cocktail (which has quickly become one of my favorites) took on a completely different character due to the pine notes giving way to warm citrus and a rich spiciness. It complimented the chocolate very nicely. I also think it made for a good Last Word and Aviation, though I would say I wasn’t a big fan of it in a gimlet. Something in the flavors just clashed. Oh, and it makes a great Negroni. Perhaps I’m crazy, but I swear you can taste hints of the unique base even with all that Vermouth and Campari. Best consumed: It makes a great martini, but I also found that its unique notes made for some interesting spins on on classic more herbal gin cocktails, such as The Last Word for example. Rating: A top notch craft gin, that pays homage to Old Tom style gins and Genever as much as it does to classic gins. Recently tried Smooth Ambler and came away very pleased with it. After reading reviews it seemed like a good pairing for a hot, summer gin and tonic. It definitely was! The citrus smell and flavor is very evident with this gin. As mentioned in review you probably don’t need lime for this gin. Though if you like a strong citrus flavor this works very well. Go to TIN 202 in Morgantown WV and ask for the Dr. Conner Martini. Oh my!